This vegetable hummus dip make store bought hummus taste incredible! I love to entertain. The whole process de-stresses me. I’m not one of those people who sits around ruminating about what to serve and how to present it and how to time everything just right. I just kind of wing it. Easy entertaining is one of the things people ask me about all of the time. Well, this dip is for all of you who want a great easy entertaining recipe to serve your guests while you are getting dinner ready. This recipe is like a “food hack”. What I mean by that is that it easily takes a store-bought ingredient and turns it into something super awesome. I mean really, really awesome. So-good-that-everyone-will-be-asking-you-for-the-recipe awesome. The base of this vegetable hummus dip recipe is store-bought hummus. Add then we add a bunch of stuff to it. And we make it pretty. And we spice it up. And serve it with beautiful crunchy vegetables for dipping. And amazing sprouted grain crackers. And it’s truly incredible. I saw a version of this dip on one of my favorite blogs (Minimalist Baker) and I took some creative license and made it suit my needs. My guests loved it and I’ve made different versions of it many times since (even when I didn’t have any guests)… it’s really that good. I really feel like I’m spoiling myself when I make this just for my family. 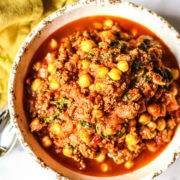 If you are looking for another great use for chickpeas, try my Spicy Chickpea, Turkey, And Tomato Stew. Sesame seeds have many great nutritional benefits. They are an anti-aging food. If you have backaches, hair thats graying way too fast, ringing in the ears, weak knees, blurry vision or general weakness, go for the sesame seeds; just sprinkle them on everything. Long ago in China, sesame seeds were ground into honey to form a paste and was taken as a medicine to counter old-age and weakness. Black sesame seeds are a Chinese herb (Hei Zhi Ma). Black foods, in Chinese medicine, are knows as longevity foods. This recipe uses tahini sauce, which is a paste made from sesame seeds and oil (I buy this read-made in a can or a jar). Combine the chickpeas in a small bowl with the oil, coconut sugar, smoked paprika, cumin, turmeric, oregano, salt, and pepper. Spread them out on a baking sheet lined with parchment paper. Roast in the oven until the chickpeas are beginning to brown and get a bit crispy (mine took about 35 minutes). Meanwhile, make the sauce: stir together the tahini, lemon juice, almond milk, dill, and garlic. Set aside. Make the salad for the top: In a small bowl, combine the parsley, tomatoes, scallion, 1-tsp of olive oil and a quick squeeze of lemon juice. Spread the hummus on a serving platter. Top with the tahini sauce mixture and the vegetable salad. Garnish with a bit of hot sauce if you like. Serve with crackers and/or fresh vegetables to dip.